Central Avenue restaurants provide colorful backgrounds for senior portraits in St. PetersburgKristina is already a little famous around this website, as she is the daughter of my oldest DSLR Photography student, Rosa, and often our model during our lessons. Her boyfriend Chad makes his debut. I already knew Kristina was a great and willing model, and I quickly realized Chad was the same, which made our candid senior portrait session a great time. An alley in St. Petersburg provides the backdrop for this senior portraitWe changed speed several times during the senior portrait session, from serious to fun, to contemplative, to relaxed, and back. Downtown St. Petersburg provides a great variety of settings within short walking distance of each other. Kristina and Chad were open to all my ideas, even this tattoo reaction shotIt was my first time to use a tattoo parlor as a prop. Not only did this allow for us to make an animated shot, the covered roof provided nice shade to shoot in, and also a break from the heat! 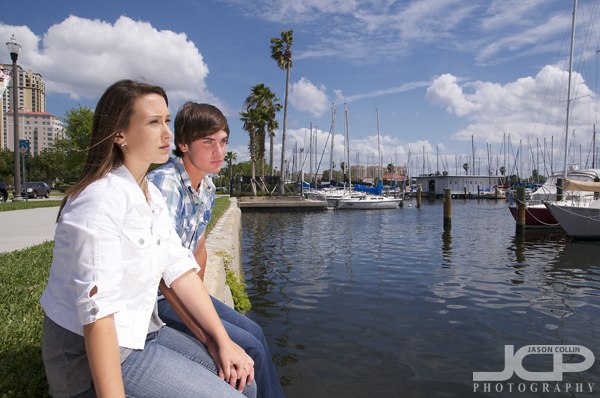 Thinking about life after high school in this senior portrait near the St. Petersburg Yacht ClubI wanted to find a creative way to work the waterfront into a shot without it just being a background. So I balanced as far out on the above seawall as I dared, holding my Nikon D300 in my left hand and stretching out my Nikon SB-600 Speedlight on a lightstand as far out in front of Kristina and Chad as I could. Fortunately all gear and photographer stayed dry. Thus a very fun and creative senior portrait session came to a close and perhaps in four years or so I might be photographing their wedding? No pressure guys! 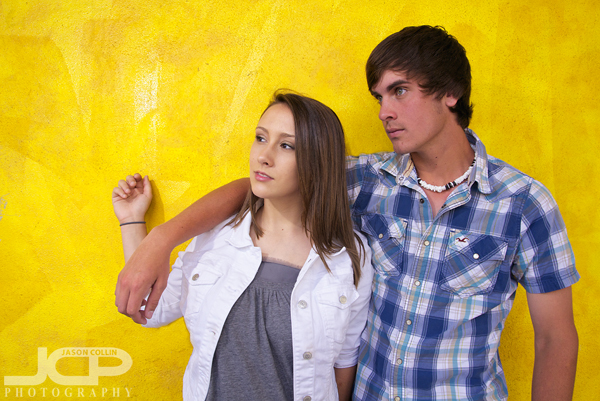 Reserve your candid senior portrait session with Jason today!